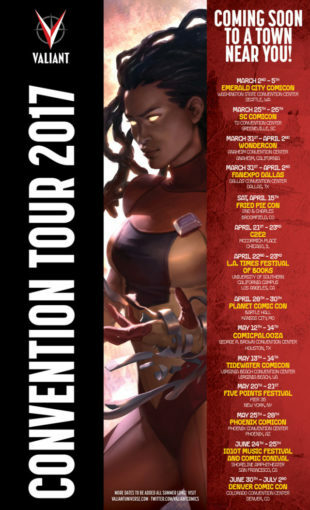 From Friday, May 12th through Sunday, May 14th, Valiant’s non-stop convention road show is coming to Houston, TX for Comicpalooza – and we’re bringing along a boatload of merchandise, programming, and panels to celebrate! All weekend long, join Valiant inside Houston’s George R. Brown Convention Center at Publisher’s Pavilion booth #25 to experience the superhero universe that’s taking the comics industry by storm with a selection of paperbacks and deluxe hardcovers for critically acclaimed and award-winning titles including BLOODSHOT REBORN, BRITANNIA, DIVINITY, FAITH, HARBINGER RENEGADE, NINJAK, QUANTUM & WOODY, SAVAGE and many more! 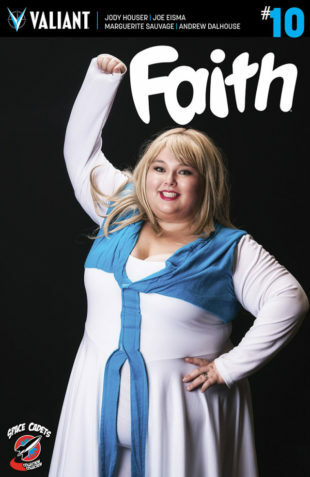 Then: Comicpalooza enters the stratosphere as Valiant joins forces with Texas’ own Space Cadets Collection Collection for the FAITH #10 SPACE CADETS COLLECTION COLLECTION VARIANT, featuring a cosplay photo cover by MDR Foto Art with model Korrine Walker! The FIRST ISSUE of “THE FAITHLESS” takes flight here in a sinister new jumping-on point as acclaimed writer Jody Houser (Mother Panic, Star Wars: Rogue One) and stratospheric artists Joe Eisma (Archie, Morning Glories) and Marguerite Sauvage (Shade, The Changing Girl) send Valiant’s high-flying hero headlong into a deadly gauntlet against unstoppable adversaries hellbent on wreaking revenge and ruin! Exclusive available only at the Space Cadets Collection Collection booth #2711 [$10]. And don’t miss your chance to have Korrine Walker sign your copy at the Space Cadets Collection Collection booth on Saturday, May 13th! Plus: Be sure to visit the phenomenal Valiant talent that’s storming into Comicpalooza all weekend long, including colorist David Baron (DIVINITY, BLOODSHOT REBORN)! Then: Blast off from Houston and into the Valiant Universe on Saturday, May 13th at 1:30 p.m. CT with the VALIANT 101: THE STORY STARTS HERE panel presentation! New to the Valiant Universe? Jump on board right here with a concise and fun-filled introduction to the origins and adventures of Valiant’s greatest and most iconic heroes – from BLOODSHOT and DIVINITY to FAITH and HARBINGER RENEGADE to NINJAK and X-O MANOWAR! From The A.V. Club to Buzzfeed and Entertainment Weekly and dozens more, Valiant has been hailed as the premier superhero publisher in comics today… Now, look no further than this panel to find out where to start! Finally: See the action-packed future that lies ahead for your favorite superheroes on Sunday, May 14th at 1:30 p.m. CT with the VALIANT: THE ROAD TO HARBINGER WARS 2 panel presentation! The road to Valiant’s biggest, most ambitious and impactful comic book event of all time starts right here! Jump on board to find out what the future holds for HARBINGER RENEGADE, X-O MANOWAR, BLOODSHOT, FAITH, DIVINITY, NINJAK, and the rest of Valiant’s most powerful heroes… and how the coming of HARBINGER WARS 2 will soon be felt across the entire Valiant Universe! We’ll see you in Houston! And don’t miss a moment of the action as Valiant’s one-of-a-kind convention road show marches on through Virginia Beach, New York City, Denver, and more throughout the summer!